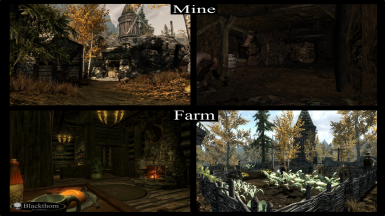 I am currently no longer modding or supporting my original Skyrim mods..Check out my new/ported mods for Skyrim Special Edition HERE or Fallout 4 HERE..Thank you again for everyone's continuing support..
Blackthorn is a large Hearthfire inspired buildable player home and town with over 400+ build options to choose from, it also includes plenty of Safe Storage, Hearthfire Style Planters, Armor Mannequins, Displays for Dragon Priest Masks, Claws, Black Books, Paragons, Weapon Racks, Display Cases, New Merchants, Indoor Smithing Area, Plenty of room for Followers and Multiple Adoption Friendly..
3. 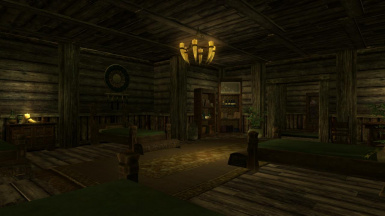 Talk to your Children/Spouse about moving into your "New Home"
NOTE: A cheaters building supply chest can be activated in the Master Bedroom of Blackthorn Manor once it is built..
Special thanks to insaneOhflex, Thyworm and Zindar55 for the video reviews of Blackthorn..
Blackthorn Manor - Adds the main player home. 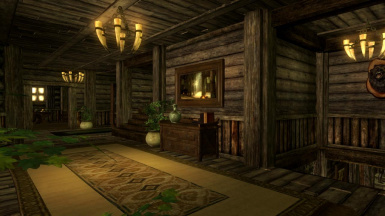 Blackthorn Manor Guest House - Add a small home behind the main house. 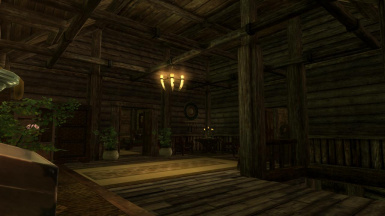 Edgewater Tavern - Extra room for followers. 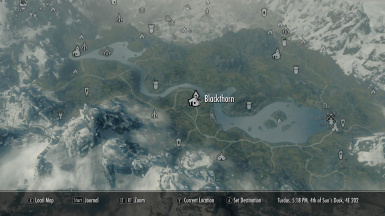 Blackthorn Mine - Adds a mine with different ore supplies. 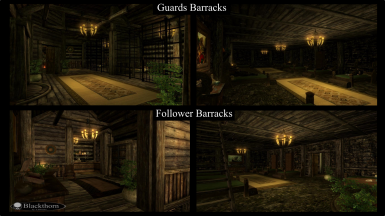 Guard Barracks/Jail - Living Quarters for all 9 hirable Guards and Jail. 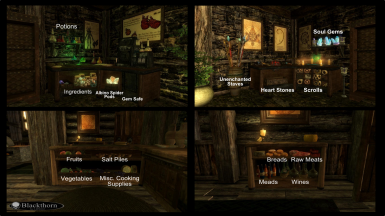 Alchemy Shop - Sells alchemy supplies. 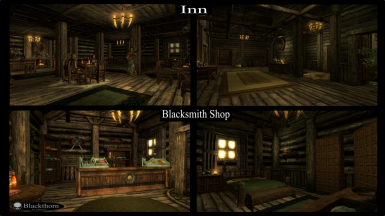 Blacksmith Shop - Sells blacksmith items and building supplies. 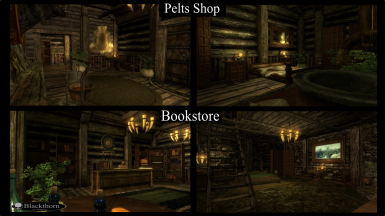 Pelts Shop - Sells pelts and hides. 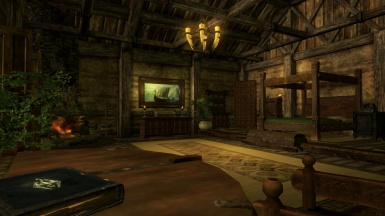 Farmhouse - Adds a farmhouse with gardens overlooking Blackthorn. 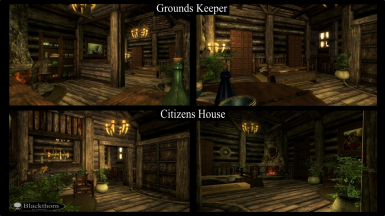 Grounds Keeper House - Adds a house to the town for a hireable Grounds Keeper. 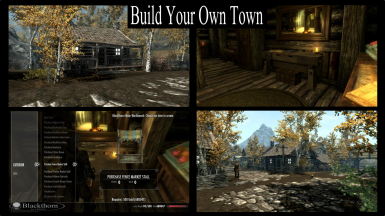 Citizens House - Adds a house to the town for Blackthorn citizens. 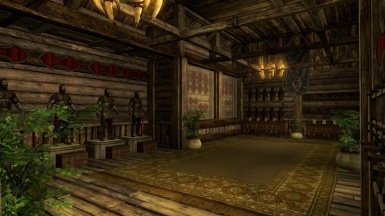 Fence Merchant Stall - Adds a stall in front of the Inn. 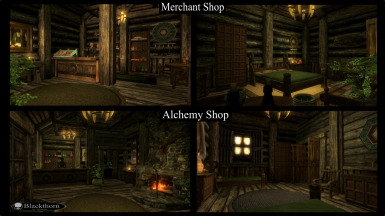 Fletcher Merchant Stall - Adds a stall in front of the Inn. 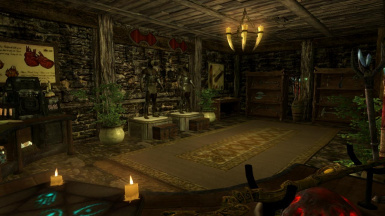 Spell Merchant Stall - Adds a stall in front of the Inn. Windmill - Adds a windmill on top of the hill overlooking Blackthorn. 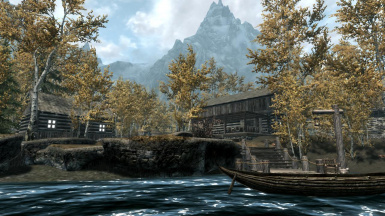 Boat Dock - Adds a pier section along the shore with a Boat Travel Option. 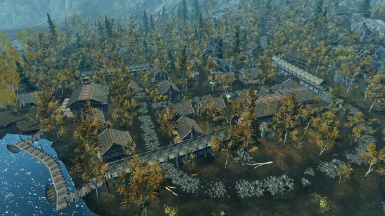 Hire Fence Merchant - Adds a Fence merchant in front a the Inn. 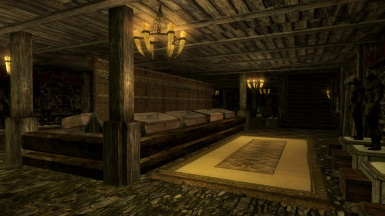 Hire Fletcher Merchant - Adds a Fletcher merchant in front a the Inn. 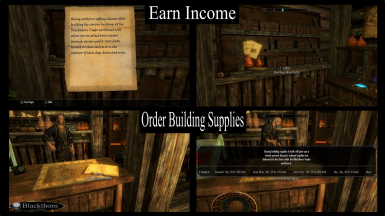 Hire Spell Merchant - Adds a Spell merchant in front a the Inn. 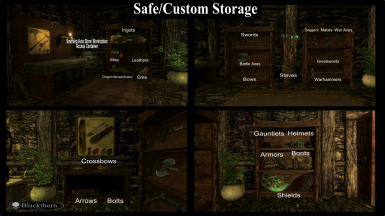 NOTE: More exterior options can be found at the interior workbenches as well. 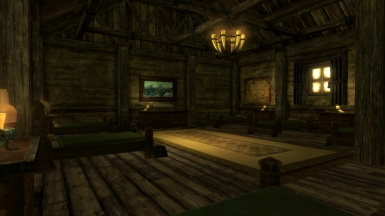 As of Version 1.5 hiring various Shop Merchants, Inn Keeper, Grounds Keeper and adding Citizen Npcs at the interior workbenches after building the various buildings at the Blackthorn Trader workbench will allow you to collect town income through various profit/rent chests located in the Study of Blackthorn Manor or in the interiors of each shop, houses and the mine. individual items from the various workbench. 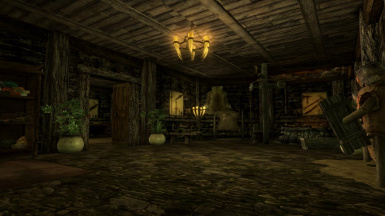 Ledger located on the store counter inside the Blackthorn Trader. 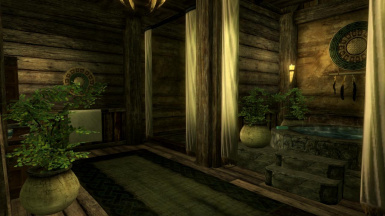 Building Blackthorn is meant to be a large buildable project that WILL take time to finish. 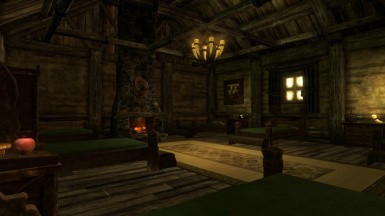 I highly recommend using the My Home Is Your Home - by Volek mod to have your followers stay and sandbox in Edgewater Inn or in the Follower Barracks. 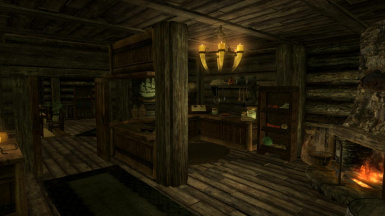 The workbench and cheat supply chest enable/disable button style activators in the Master Bedroom must be pressed twice when first using in order for the change to take place. 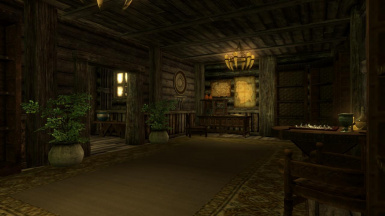 The 1st floor workbenches in Blackthorn Manor, Edgewater Inn have build options for the exterior. Building items too fast and not allowing the screen to fade to black after each item is built can cause items to sometimes not appear. 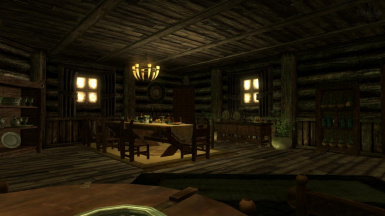 waiting 10-15 seconds when first entering the home should return the FPS to normal after everything has time to load.. 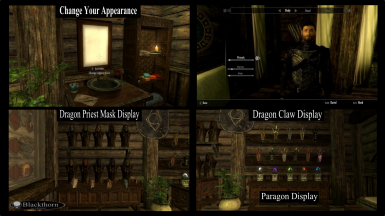 Mannequins are heavy on memory, there's a few memory patch mods available that will help with loading related issues..
2. 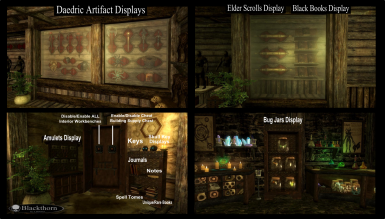 Manually install contents of archive in Skyrim/Data folder. Make sure to save outside of the cell being uninstalled. 2. 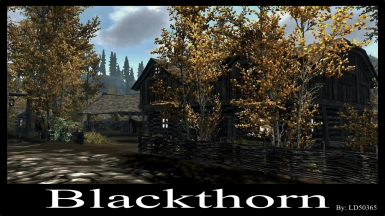 Delete the BlackthornManor.esp and any other files from this mod from your Skyrim/Data folder.